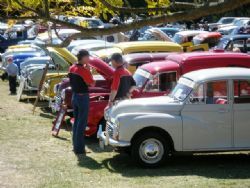 After a pleasant day out last year I fronted back to check out the All British Day 2009 at the spectacular Kings School in Parramatta. Blessed by knock-out weather and a bit more grass to reduce the dust compared with 2008 there was a solid turnout of all the classic British marques. Everything from Rolls to Morris was on display and all the various car clubs were well represented. 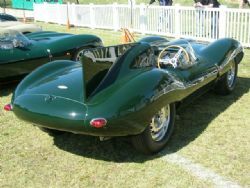 A number of the clubs use this event to run a concours and the Jaguar site on the bottom oval was brimming with pristine examples being thoroughly inspected by the judges. Other clubs had their tents and marquees set up and their members were appreciating the social aspects of this show. Numerous participants were quaffing a chilled chardy with lunch and the carnival atmosphere matched the smiles on faces of those enjoying the event. 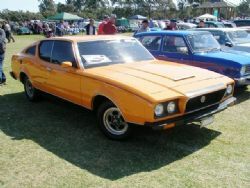 Along with a thousand plus cars there is a market, art show and kids carnival which provides plenty of distractions for the whole family while dad gets a good chance to slip off and view the classics. It is not just about pristine examples – there are plenty of driven vehicles here and a number that appeared to have never seen the inside of a restoration shop. It appeared numbers were slightly down on last year which made it easier to get around and see everything. 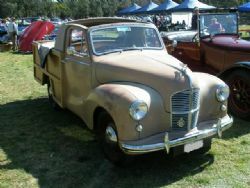 The NRMA Veteran, Vintage and Classic Insurance trade stand had a few of their old road service vans on site and other vendors included Meguiars and The Classic Throttle Shop. Getting close to the food and coffee vendors was as difficult as 2008 with queues that would test most people’s patience. This event is run around the beginning of spring each year and is worth a visit with the whole family. There is always plenty to see and do and knowledgeable enthusiasts only too happy to have a chat about their favourite marque.